When you picture a weight room, men pumping iron may be the first image that comes to mind. However, strength training should also be a key component of women's workout routines, especially as they age and work to stay fit. "Women need a combination of cardiovascular exercise and weight training. Cardio exercise is best for the heart and for weight control, and strength training is best for the bones and for muscle mass," says Heather Nettle, MA, an exercise physiologist in Cleveland Clinic's Department of Sports Health and Orthopaedic Rehabilitation. Women will not gain excess bulk like men's bodies do with continued weight training. Instead, strength training in women leads to a higher resting metabolism rate (RMR), which keeps body fat down and increases lean mass. 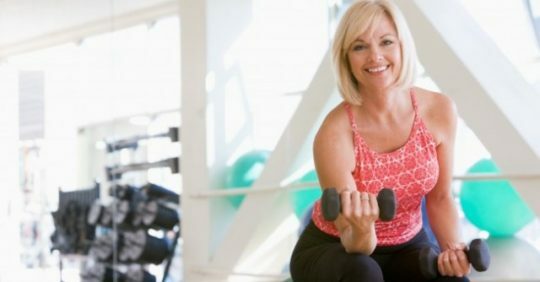 Weight lifting has added benefits: promoting strong bones to protect against osteoporosis and helping with balance to reduce risks of traumatic falls. Everybody has six pack abs, according to Nettle. “You want to make sure you're bulking up your muscle mass to boost your metabolism, which will help define the muscles. Without muscle bulk, you don't have tone," she continues. For other exercise tips for women interested in promoting health and weight loss explore the ideas below. Try lower-intensity exercise for a longer period of time, in combination with heavier cardiovascular workouts. Walk for an hour instead of jogging for half an hour. More is not always better; the lower your exercise intensity, the fewer total calories burned, but the greater the number of calories used from your fat sources. Eat enough calories if you're exercising a lot. Eating too few calories may start to break down muscle mass and slow your RMR.